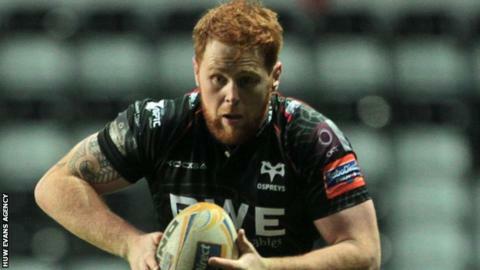 Ospreys have given twice-capped Wales number eight Dan Baker a three-year contract. The deal will keep the 21-year-old at the region until the end of the 2016-17 season. Baker is the 10th player to commit his future to the region, with others including lock Alun Wyn Jones,wing Eli Walker and prop Ryan Bevington. "I'm really happy. Ever since I was a kid, all I wanted to be was an Ospreys player," said Baker. "This year I've been able to play for the region and now I've got my first pro contract. I'm really happy to be here for the next three years. "It's been a very good year for me. I'm pretty lucky to have got the experience in Japan with Wales last summer, and now that I'm fully fit after a few months out, it's brilliant to be playing regularly for the Ospreys." A Wales age-grade cap, Baker featured in the historic 9-6 win over New Zealand Under-20s in the 2012 Junior World Championships as the Welsh youngsters progressed to the semi-final. He received his first call-up to the senior Wales set-up in 2013, going on the summer tour to Japan and gaining two caps. His performances this season have also put him into contention for Wales' summer tour of South Africa. He is the third Ospreys forward to have signed this week, following South African lock Rynier Bernardo and Swansea prop Nicky Smith. Ospreys rugby operations manager Andy Lloyd said Baker was an important part of the region's plans as they build a team for the 2014-15 season. "He's something of a crowd-pleaser with the 'go-forward' he gives the team. Physically, he's very strong, very powerful and a great ball carrier," said Lloyd.